Candy making can be a daunting task. Once a year, during the holidays, I make homemade caramels from a handwritten recipe my mother gave me a few years ago. Motivated by a good friend’s love for them, a couple days ago I made the season’s first batch of savory, sweet, Fleur del sel caramels. The original recipe calls for chopped pecans but I modified it by topping it with flaky Fleur del sel sea salt instead. Even with the best candy thermometer money can buy, getting candy to turn out exactly right can be very tricky. The candy thermometer was exactly 244 degrees, as the recipe called for when I took it off the stove. The caramels turned out delicious but the consistency was more like a hard sugar daddy sucker. Maybe next time I need to wear my reading classes to confirm that the little red line is exactly where it’s supposed to be. It was surprising how fast it went from 220-244 degrees, maybe I was just too slow at taking it off the stove. Two hours of hard work down the drain. Inexpensive ingredients, but still frustrating. When my arm was recovered from the constant stirring of the first batch, I attempted it again. Still nervous about the possibility of over cooking, I adjusted the take-off-the-stove temperature down to somewhere between 238-240. 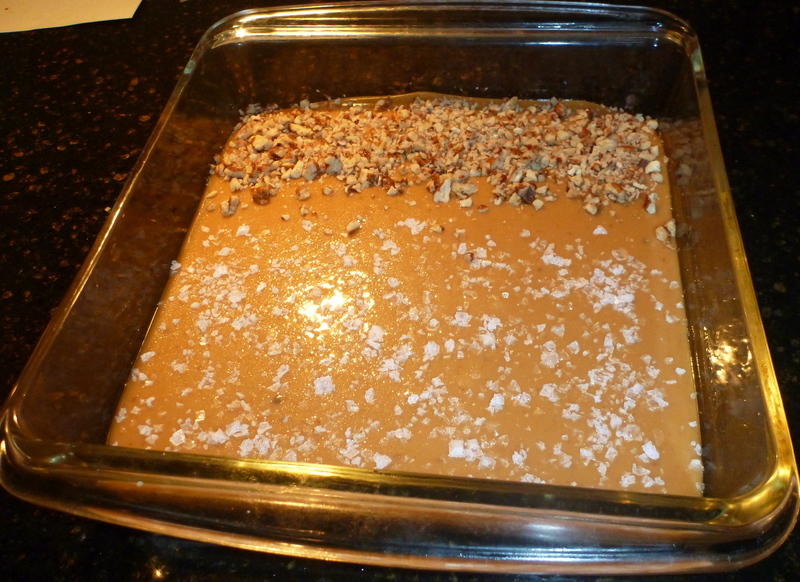 The caramels turned out softer than before but still not squeeze between your fingers soft. 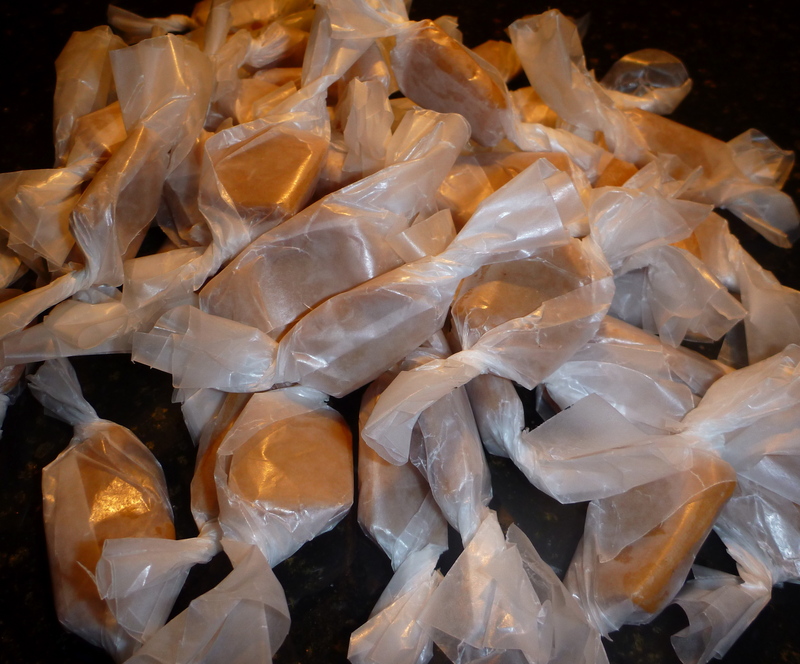 These caramels are easy to make but it’s amazing how just a few degrees can make or break you when it comes to candy making. Next time, maybe I’ll even take it down a couple more degrees. Candy wrappers (5″x5″). I make my own from a roll of wax paper. Recipe makes about 70 caramels, about 1 inch in size. Butter 8″x 8″ pan. 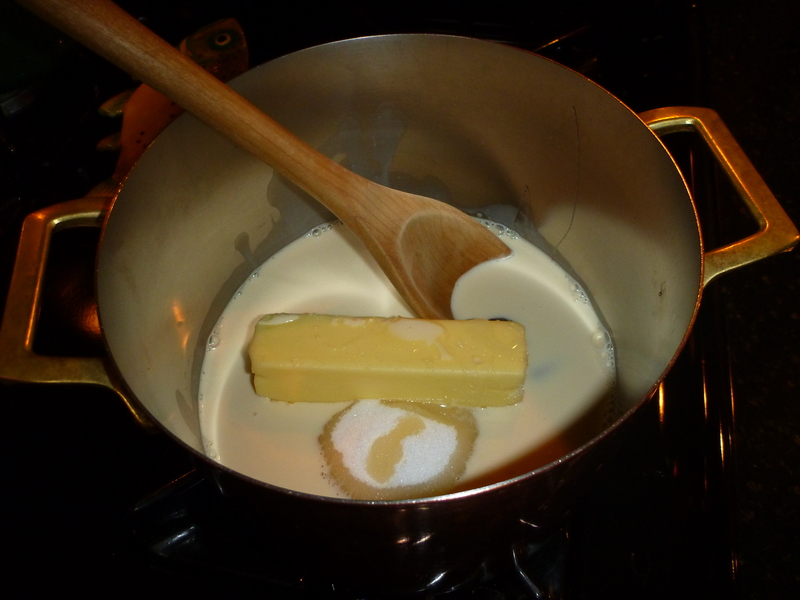 Combine sugar, butter, 1 cup of evaporated milk, and corn syrup in medium size heavy saucepan. Bring to boiling over medium heat, stirring constantly. Add remaining milk slowly so that the mixture continues to boil. 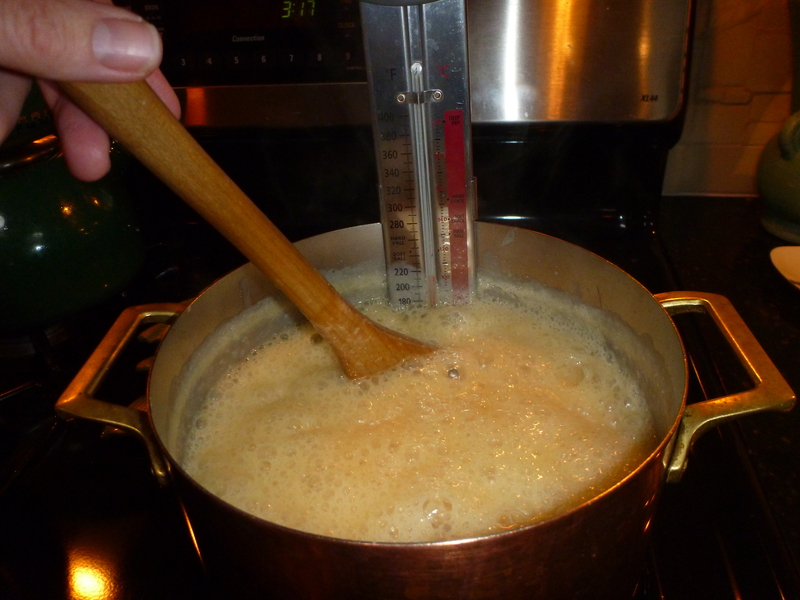 Cook, stirring constantly, over medium heat about 30-40 minutes until candy thermometer reaches 240 degrees (soft ball). 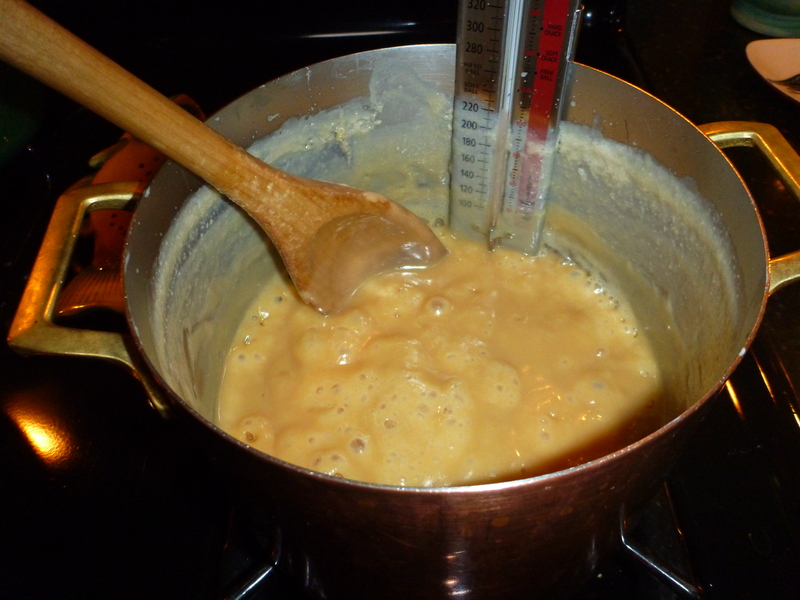 Take off stove, add vanilla, stir, then pour caramel immediately into buttered pan and sprinkle top with salt. (chopped pecans can be used as well). Cool, turn pan upside down onto cutting board, cut into desired sizes, then wrap. Mixture will bubble up so make sure your pot is big enough. Mixture will reduce and turn golden when temp reaches 244 degrees. Caramel poured into pan and sprinkled with Fleur del sel salt and some pecans on 1/4 of it for those loved ones who don’t like salt. When cool, cut into desired sized pieces. 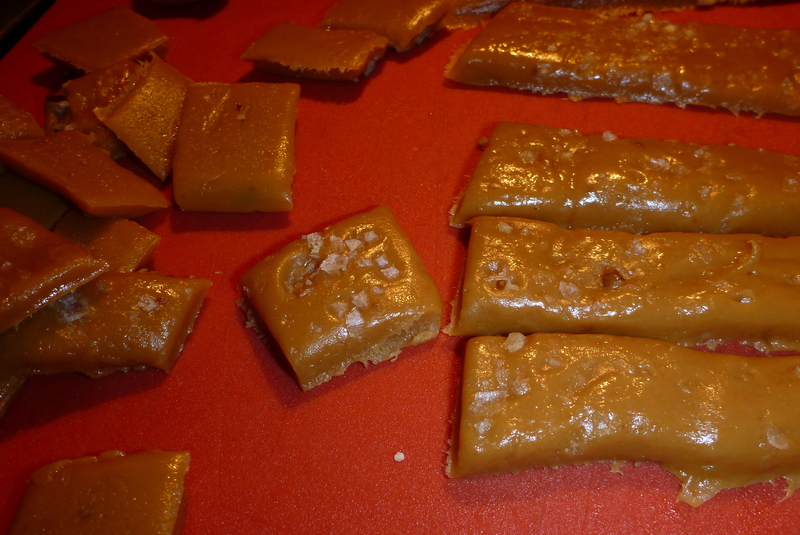 Sweet and savory, Fleur del sel caramels. Ready for gift giving! The whole process of cutting your own wrappers, cooking and stirring the caramel, cooling, and wrapping the candy takes a couple of hours. Invite your loved ones to help you stir and wrap. Have fun!